Online training can save managers both time and money and has grown in popularity as businesses move other HR duties to the cloud. Use our powerful training module to get your staff on-boarded, refresh with company policies and procedures, product/service related up-to-date information. Create training sections and topics within each section - > Assign it to your staff and track the training progress online! The Training module can be enabled from the tab Settings - > Account - > Training. 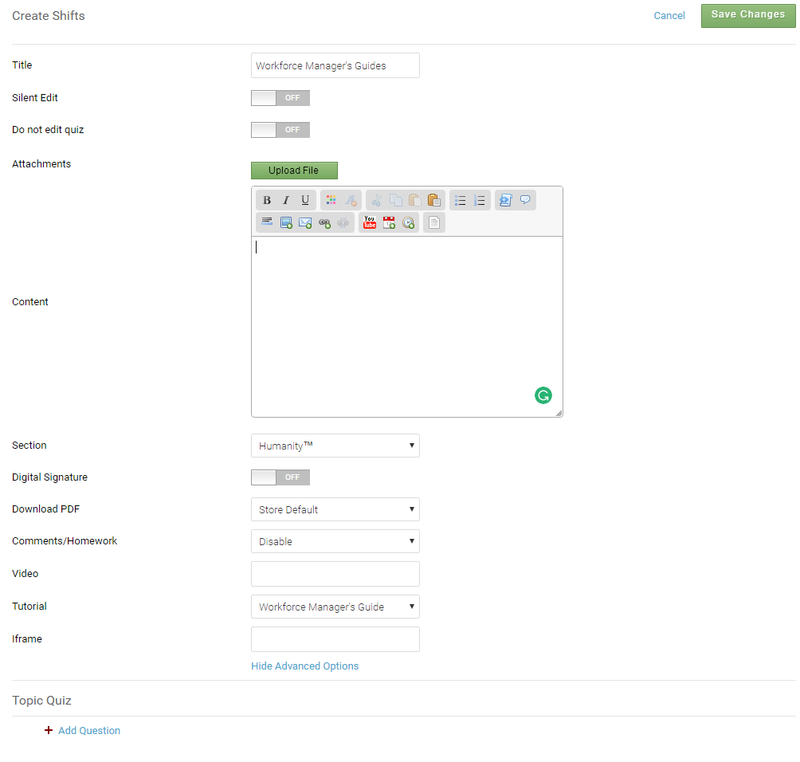 Once enabled; go to the training module where you can create Sections and Topics within each section. 'Sections' serve as a unit to organize training 'Topics' (You can think of them as a folder). Click on the option 'Add Section'. 'Topics' are the main unit of the 'Training' module. 'Topics' contain training content in text and interactive forms. To add a Topic to a 'Section', click the ‘Add Topic’ link located under the desired 'Section'. To edit a 'Topic', click on the 'Topic' title. You will see the 'Topic' information and an ‘Edit’ link in the upper right corner. 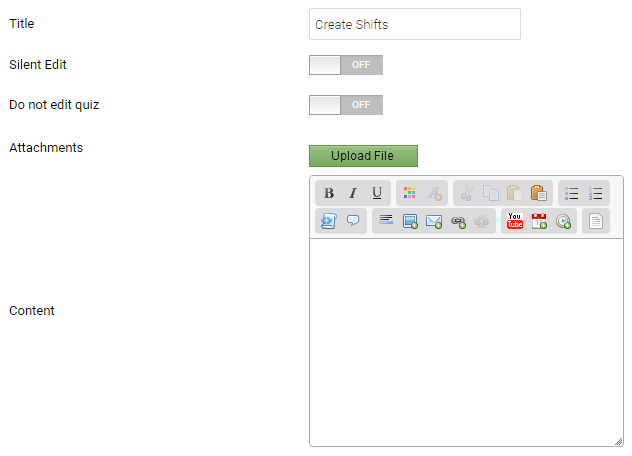 Start adding the content with videos and images or simply upload the file. You can attach files to a training 'Topic' under 'Attachments' by clicking 'Upload File'. Section: under advanced settings let you sort the topic under the appropriate Sections. Comments: Enable the Comments feature if you want your managers/staff to leave comments for you to review at the time of completing a training topic. HomeWork: When a topic is set as ‘Homework’ only the employees that are assigned to the topic can send homework and you can set it such that only ‘Managers’ or ‘Managers/Employees’ can view it. Assign Topics: Allows you to assign 'Topics' to staff by Position, Group, Skill, and User. If your staff is assigned those 'Positions' then they will also be assigned to that 'Position's' training 'Topics'. Within the edit topic section, is the option to assign the 'Topics' to staff 'Positions'. Check the boxes next to the staff 'Positions' that you want to complete the particular training topic. Tutorial: Want to train your staff quickly on Humanity™? 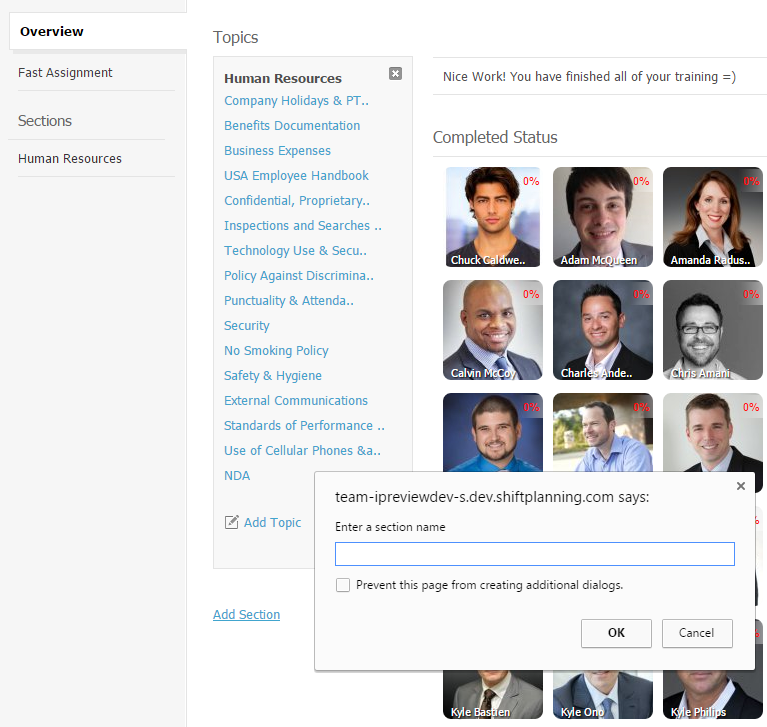 Use this section to quickly add tutorials to your training topics and assign to your staff. Add Quiz: Test your staff knowledge on a specific topic by adding quiz on the topic. 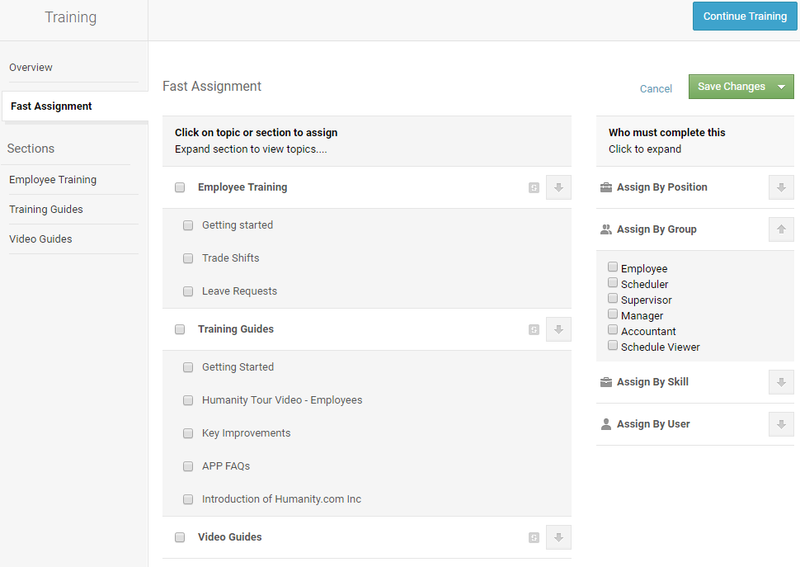 In addition to assigning staff directly by editing a topic, you can also use the 'Fast Assignment' feature to quickly assign staff to your training topics visible in one convenient place. If you wish to delete the 'Topic', open ‘Edit.’ At the top right of the 'Topic', there will be a ‘Delete’ link next to the green ‘Save Changes’ button. When staff completes the training 'Topic' modules, green checks will appear beside the topic names. When you click on the 'Topic', you will see a breakdown of staff that has completed the 'Topic' and those that have not. The staff who have completed the 'Topic' will have a green check by their names, and the numerical breakdown of completion will appear in parentheses beside the 'Topic' name as a fraction.